The pace of progress is quickening as we begin this, our second in the series of our history of banking as if it occurred in one week. 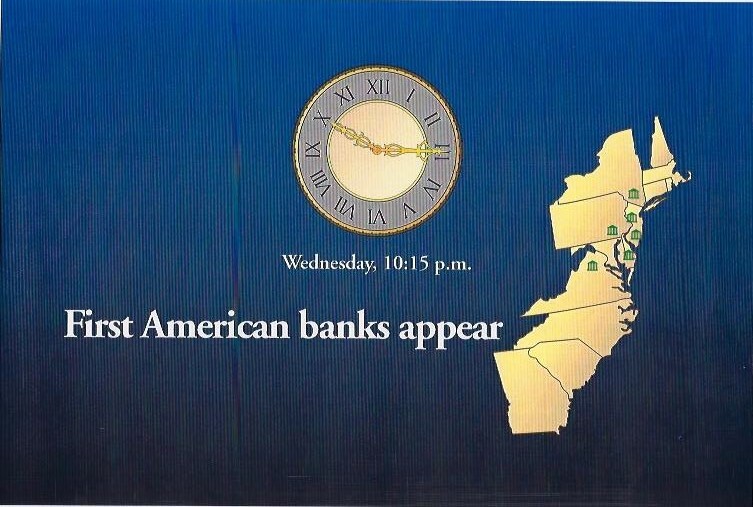 But, it isn’t until 7:26 on Wednesday morning that the story of American banking starts to unfold. The actual date is 1741 and the problem is tight British control over the number of coins entering the Colonies. 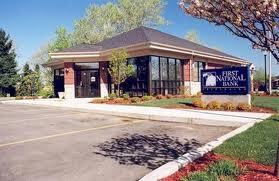 Americans are tired of relying on crop notes and barter, and decide to start banks of their own. The predictable response is a legal roadblock. The British prohibit banking and the experience sours many American Colonists on financial institutions. This Wednesday of our banking week closes with a very significant American event, the end of the Revolutionary War. It is 14 minutes after midnight on Thursday before Alexander Hamilton establishes a federally chartered Bank of the United States over Thomas Jefferson’s strong objections. Yet the charter of the bank runs just 20 years and by Thursday evening it is dead. In fact, when the U.S. Government needs to borrow $11 million to buy Louisiana – in our time sequence this 1803 event takes place at 9:29 on Thursday morning – no U.S. bank has enough clout to finance the deal. Fortunately, a British institution steps up to the plate. For America, Thursday turns into a very long night filled with the nightmare of the Civil War. Yet as Friday dawns, the United States enters a promising new day. The country is unified and state banks are flourishing. Though state banks in the South had weakened or disappeared, a rebirth has begun. It is mid-day on Friday – 11:31 a.m. – when the National Bank Act of 1863 passes. The leaders on this Friday are men of integrity like Israel Lash, who launches the First National Bank of Salem (N.C.) to serve thrift-conscious Moravians, after it becomes clear that The Bank of Cape Fear’s Salem branch (Lash’s former employer) will not be part of the revival. Late this Friday morning, Alfred Austell founds one of the oldest banks in Georgia in his home. Though the Reconstruction Act absolved Austell from any obligation to redeem his former bank’s Confederate money, Austell depleted his personal fortune to exchange this money for gold, an act of faith his former customers clearly remember. As the National Bank Act strengthens federal control over banking and currency, Austell, Lash and fellow bankers are encouraged to make new beginnings. Over the lunch hour that Friday, it appears American banking has finally gained a stability that has been very elusive during its first two days of life. At long last the nation has a uniform currency, gained primarily by taxing state-chartered bank’s notes, rendering them of insignificant value. On Friday – the fifth day in our banking week – the nation is charged with great creative energy. Before Friday ends, Thomas Edison produces the first commercially viable electrical lamp and George Eastman markets his first box camera. Yet as Friday – and the first five days of modern banking history – draw to a close, surprisingly little has changed in the way banks operate. The Monday morning customers of Amsterdam Wisselbank would feel comfortable in the Friday evening banks of the United States. However, there are blips on the radar screen that predict a storm of activity. For example, when transatlantic cable is laid in the 1870s – 3:43 p.m. Friday in our time line – some bankers realize they can take advantage of small price differences in New York and London markets to profit on arbitrage. This begins a much more creative time and one that evidences strategic innovations that will ignite a tremendous leap forward in the pace of change, yet one that also will elevate that risks and develop new challenges for the industry. We will discuss those changes over the next few weeks. This step should be in process continuously. It involves determining which positions need successors and what knowledge, skills and abilities will be needed for those positions in the future to have a successful enterprise. Development, when affordable, should start early. This, too, is ongoing. It is the training and development of the inside candidates and the search for and recruitment of outside candidates that fit the ideal candidate profiles. This step takes time to implement…maybe years if you hope to develop talent internally. Here you are screening, selecting and negotiating terms with the successor. Often, you will need to circle back and revisit plans and development steps if strategies change. Eventually, though, a successor must be chosen. monitored. Most new employment relationships that are going to go bad will do so during the first six months while a transition is occurring. Click here and request a contact, or call me at 919-732-2716.
al team with these KSAs. I would be happy to present this and other succession planning topics to your owners, Board and/or your Management Team as an introduction to our Succession Strategy, Executive Development and Executive Search services. Call me at 919-732-2716 or click here and complete the request form on our website and I will reach out to you. Two of the current challenges in banking are 1) Gaining Efficiencies, and 2) Utilizing Technology to improve delivery channels. Some strategies are more complicated than others in terms of how to address these two challenges. However, some are more straightforward than you might think. Tom Brown has made an interesting appraisal of the need for a big branch network in today’s banking world: “Did you see earlier this month that, to cut costs, a couple of banks in the Midwest announced they’re shutting down some of their under-performing branches? Good for them. I’m just surprised more banks aren’t doing the same thing.One of the more pressing—and least-talked-about—issues facing the banking industry is the question of what the heck banks are going to do to contain the costs of their sprawling distribution systems, particularly their branches. Even before the passage of Dodd-Frank added new financial burdens to the industry, branch networks were set to become a serious money pit. First, alternative delivery channels, from ATMs to on-line banking, are cheaper and more convenient for customers. (The newest innovation set to go mainstream, remote deposit capture, will dispose of the final rationale for many more bank customers to ever visit their branches at all.) As it is, in-branch transactions have been declining for years. By many measures, the numbers are truly tiny. For example, the typical branch generates just 20 new demand deposit accounts per month. Yet the industry remains wildly overbuilt, thanks to the branch-building boom that took place during the middle of the last decade. Many of these newer branches (along with marginal legacy branches) are burning cash. This can’t go on forever. The economics of bank branches vary broadly and can change depending in the level of interest rates, but a good rule of thumb is that a branch needs to have $40 million in deposits to be profitable. If that’s so, a huge number of the country’s bank branches are money losers as it is—and many more will be once interest rates start to rise from their ultra-low levels and savers pull their deposits to seek higher yields elsewhere. Some banks have done what they could to bring branch costs down—by cutting staff, for instance. But in many cases, that won’t be enough. Managements who think they can magically make their most marginal branches profitable are kidding themselves. Yet despite the challenges branches face, the bankers I talk to seem to be dealing with the problem by basically not thinking about it. Too many apparently believe it will go away by itself. Which is why I think it’s great that Independent Bank Corp. and Old National are proactively recognizing that they have a problem, and are doing something about it. For further discussion about this issue, click here and give me your contact information on the form that pops up. The Dodd-Frank Act, signed into law in July 2010 by President Obama, requires publicly traded companies to disclose the following additional information in their proxy. A disclosure regarding the relationship between a company’s financial performance, including changes in shareholder return and the executive compensation actually paid. A comparison of the dollar amount of the median of annual total compensation of all employees (excluding the CEO) and the total annual compensation of the CEO, with a ratio of CEO total compensation to the median total of all employees. Total Compensation is expected to be defined according to the SEC rules for calculating total compensation for named executive officers in the Summary Compensation Table in the current proxy disclosure rules, but we will have to wait for the SEC rules to be certain. The final rules regarding these disclosures is the responsibility of the SEC but the Agency has no deadline for publishing the new rules. A recent comment from SEC Chairwoman Mary Schapiro indicated that the final rules would not likely be in place for the 2011 proxy season. One challenge (and burden) for all companies will be the requirement to calculate the total compensation of each employee under the same rules as named executives in the proxy to then be able to calculate the median value. This will require computing the value of equity awards, bonuses, perquisites, changes in the value of pension plans for all employees (full and part-time) and a conversion to US dollars of foreign subsidiaries employees’ compensation. The Act does not limit these disclosures to the proxy statement but includes disclosure in a number of SEC filings (i.e. registration statements and quarterly and annual financial statements). It’s obvious that this new disclosure provision of the Act will require an inordinate amount of time and effort to comply. Furthermore, it will also likely require a good bit of narrative for companies to explain their methodology and computation of all employees total compensation, especially when the ratio comparing CEO’s pay to the median of all employees is seen to be excessive or out of line with peers. What will this new disclosure reveal about a company’s compensation strategy and philosophy? Will companies change their compensation strategy as a result of this disclosure? Will it influence the type of compensation offered in order to reduce or minimize the total compensation value calculation? What does the proposed ratio really tell us about the value of a CEO’s compensation? These are but a few of the questions that come to mind in light of the “unintended consequences” of the new Act. We are working with clients on methods for collecting necessary data for disclosure and preparing draft proxy statements for Committee review. We recommend companies begin to prepare early for these new disclosure rules that will become required once the SEC publishes the final rules.